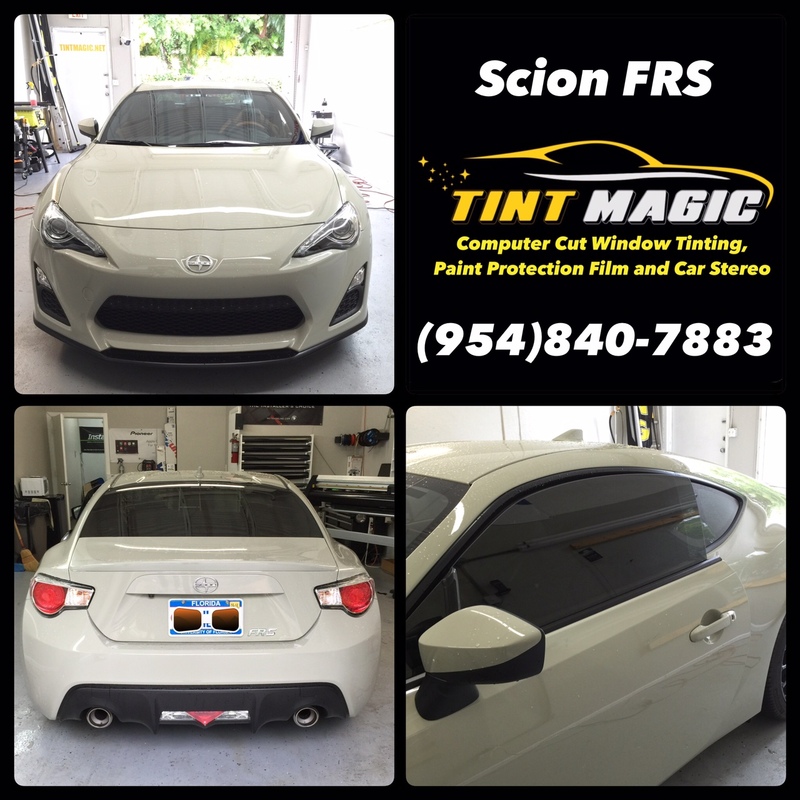 Scion FRS at Tint Magic Window Tinting Coral Springs. 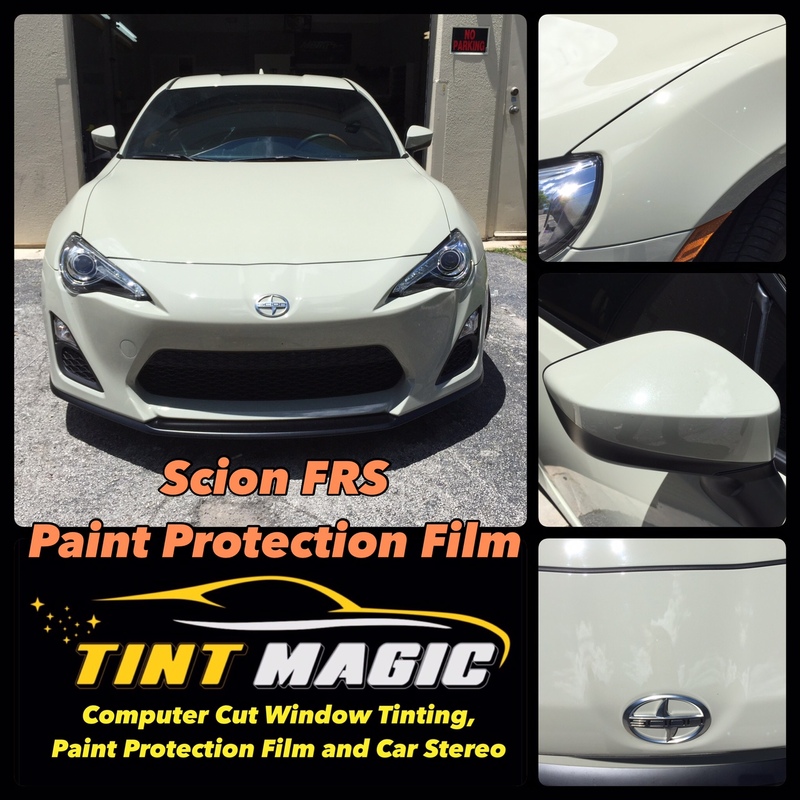 We applied Llumar CTX 15% window tint all over around Scion FRS, for the best heat rejection and 99%UV protection. We applied SunTek Paint Protection Film ( Clear Bra) to hood, fenders, mirror and whole bumper to protect original paint from rocks, debris and insect can cause some damage to the paint. Offering sports-car agility on a budget, the FR-S features excellent driving dynamics for a manageable price. Only one engine is offered—a 200-hp 2.0-liter flat-four—with a six-speed manual or six-speed automatic. The manual shifts with a solid, no-nonsense feel, while the paddle-shift automatic is quick and responsive. The cabin is cramped and plasticky, but the FR-S is very agile, which endears it to enthusiasts. Scion’s demise moves the FR-S to the Toyota showroom for 2017 under the name 86. Although Scion and Subaru have separately tweaked their models over the years, they continue to share the same 200-hp 2.0-liter flat-four engine and lightweight, rear-wheel-drive chassis, as well as their sleek bodywork and driver-focused interiors. These are still very fun and affordable sports cars, albeit ones with minimal refinement and practicality. The Scion’s changes for 2016 are modest and focus on dressing up the previously drab interior with silver accents on the steering wheel, console, dash, and doors. Also new are a standard backup camera and Pioneer infotainment system with a seven-inch touch-screen display. The latter once again has an aftermarket look and feel, but its features and usability are significantly better than the previous unit’s infuriating setup. Similarly, the brighter trim is a welcome improvement on the early FR-S’s all-black décor, even though it does nothing to address the excessive road and engine noise that still invades the cabin. Fortunately—and most important—the FR-S’s primary controls remain ideally arranged and rich with feedback for spirited driving.